One of the cool things we’ve been able to do is determine an exoplanet’s color. The planet is known as HD189733b, and as seen in an article published in Astrophysical Journal Letters, it has a blue color. This does not mean this planet is Earth-like in any way. Neptune is also blue, and it is hardly a paradise world. I’ve written about this exoplanet before, where it was found that the hot Jupiter-type planet has atmospheric winds of over 6,000 miles per hour. We now know that its atmosphere contains silicates which give it a blue color. It seems its atmosphere is filled with small droplets of silica that scatter blue light, giving it a blue color. But just how did astronomers determine the color of a planet they can’t directly see? They adapted a method long used to determine the color of stars. Stars are categorized by what is known as a photometric system. Basically you observe the brightness of a star through different filters. These filters block out all light except for a narrow color range. By measuring the brightness at different colors (wavelengths) you can determine the overall color of a star. For example, if you measure the brightness of a star at a blue wavelength and a green wavelength (known as the visible, since green is in the middle of visible light), then you can compare them. If it is brighter in the blue than visible, then it will appear more blue. If more visible than blue, then it will appear white (not green, for reasons I’ve written about before). In astronomy we take the difference between the blue and visible brightness measurements to give what is known as a BV color index, which is a common way to categorize stars. In this particular research, the team also made observations in the ultraviolet range, to create a UB color index as well. Combining these two (a photometric method known as UBV) they determined its color in the visible spectrum. The result can be seen in the image here, where the BV index is vertical axis, and the UB the horizontal. You can see the color of HD189733b is about the same blue as Earth, but lacking the greenish tinge of our home planet. It truly is a blue world. 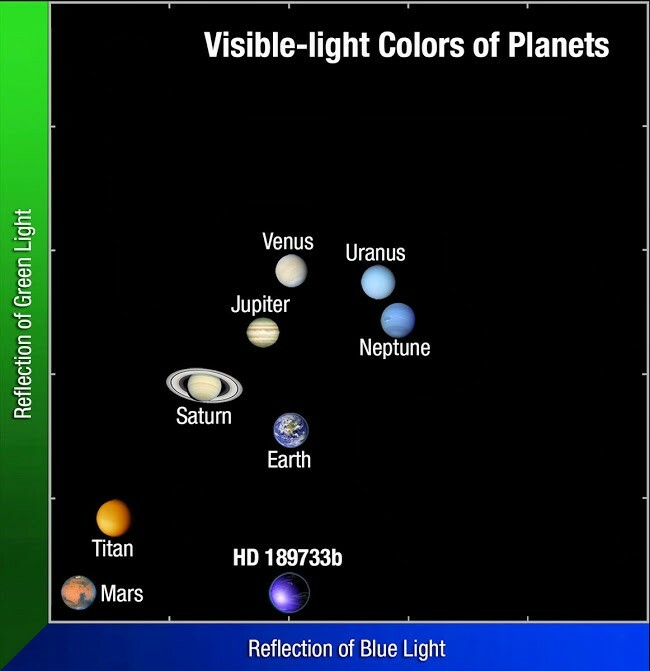 Of course HD189733b is very close to its star, so how can we be sure that the color measured is really from the light of the planet? The team measured the polarization of the light to distinguish planetary light from starlight. If you looked at a vibrating string, for example, it could vibrate up and down, or side to side, or diagonally, etc. The orientation of the vibration is the polarization of the wave. Light waves have a similar orientation. For starlight, the orientation is all random, so any orientation averages out (we call such light unpolarized), but when light scatters off an object, the scattered light can be polarized. This happens when light is scattered in our atmosphere, something even the Vikings knew. What the team did was measure the polarization of the light coming from the planet and star. Since the starlight is unpolarized, it wasn’t affected by the measurement, but the polarized light scattered by the planet’s atmosphere was affected. So the team could distinguish the planet’s light from the light of its sun. It’s a clever technique that we can use to determine the color of other planets as well. For now, we know that at least one exoplanet is true blue.